The "content" of the Down With Spit Up site are published for informational and entertainment uses only. It is not a substitute for professional medical advice or diagnosis. The information contained in this website is for general information purposes only. Information does not constitute professional advice. Information is subject to change. We make no representations or warranties of any kind, express or implied, about the accuracy of information on products, services or graphics. No information on this blog will be understood as official. Not even close, by any stretch of the imagination. Contact your doctor or medical provider for guidance in these matters and call 911 or visit your closest medical facility in an emergency. This blog may contain external links to other sites. Down With Spit Up does not control or guarantee the accuracy, relevance, timeliness, or completeness of information on external Websites. Links to particular items in hypertext are not intended as endorsements of any views expressed, products or services offered on outside sites, or the organizations sponsoring those sites. Down With Spit Up does not recommend or endorse any content shared on this site by other members. You engage and share this information at your own risk. We value your privacy. Your personal information, including email, will be kept confidential and will never be sold to third parties. It will only be used for communications you request related to the services provided by Down With Spit Up. 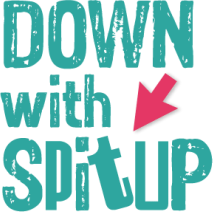 Down With Spit Up forums are designed to promote community and share ideas and resources, in a positive environment. Any posts, comments or other materials that are inappropriate, offensive, off-topic, flat-out rude or obviously promotional, will be promptly removed. In my world, I know something about keeping it clean, so please do the same. Any buyer or user of any product available or featured on Down With Spit Up agrees and acknowledge that they are used at your own risk and you should assess the risks specific to your situation before purchasing any product or using any product with your child or a child in your care, and consult with your doctor or medical provider before any action is taken.